Bentahar, S., Lacherai*, A., Dbik, A., El-Messaoudi, N., El-Khomri (Morocco), M. (2015). Equilibrium, Isotherm, Kinetic and Thermodynamic Studies of Removal of Crystal Violet by Adsorption onto a Natural Clay. 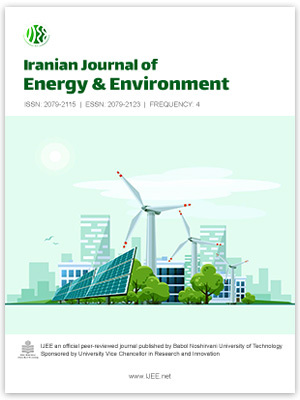 Iranian Journal of Energy and Environment; previously called: Iranica Journal of Energy & Environment, 6(4), -. S. Bentahar; A. Lacherai*; A. Dbik; N. El-Messaoudi; M. El-Khomri (Morocco). "Equilibrium, Isotherm, Kinetic and Thermodynamic Studies of Removal of Crystal Violet by Adsorption onto a Natural Clay". Iranian Journal of Energy and Environment; previously called: Iranica Journal of Energy & Environment, 6, 4, 2015, -. Bentahar, S., Lacherai*, A., Dbik, A., El-Messaoudi, N., El-Khomri (Morocco), M. (2015). 'Equilibrium, Isotherm, Kinetic and Thermodynamic Studies of Removal of Crystal Violet by Adsorption onto a Natural Clay', Iranian Journal of Energy and Environment; previously called: Iranica Journal of Energy & Environment, 6(4), pp. -. Bentahar, S., Lacherai*, A., Dbik, A., El-Messaoudi, N., El-Khomri (Morocco), M. Equilibrium, Isotherm, Kinetic and Thermodynamic Studies of Removal of Crystal Violet by Adsorption onto a Natural Clay. Iranian Journal of Energy and Environment; previously called: Iranica Journal of Energy & Environment, 2015; 6(4): -.